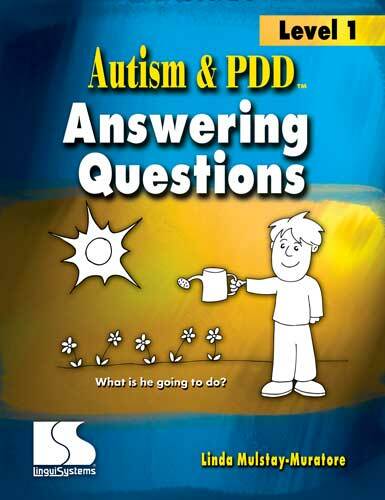 Book is designed to help children who have difficulty thinking abstractly or out of a specific context. Simple illustrations help young students (ages 3-5) understand the logic behind the question and respond appropriately. Students look at the picture, read/hear the question or statement at the top of the page, and respond. The visual prompts and cues help children with a diagnosis of autism or pervasive developmental disorder bridge the gap between concrete and abstract language. The complexity of response can range from single-word answers to complex utterances. Visual prompts can be faded and question forms intermixed to facilitate generalization of the question concepts.